Classic cable regulator in a Cherry finish, elaborate decorations in pediment and base, Arabic 180mm dial with second indication. Fitted with the SMV 03 movement. Kieninger 2169-41-01 - 0 Delivery about two weeks directly from Kieninger. Click here to view the Kieninger 2169-41-01 Clock Details page. Click here to view the Kieninger 2169-41-01 Options and Prices page. Fitted with the PS 055 movement. Click here to view the Kieninger 2171-23-03 Clock Details page. Click here to view the Kieninger 2171-23-03 Options and Prices page. Fitted with the RWS 13 movement. Click here to view the Kieninger 2171-23-04 Clock Details page. Click here to view the Kieninger 2171-23-04 Options and Prices page. Fine cable regulator in a Cherry finish with polished burl applications and small drawer for the crank key in the base, featuring a genuine 180mm enamel dial with seconds indication, milled Vienna-style hands and a polished grid pendulum. Kieninger 2171-41-01 - Please request a delivery forecast. Click here to view the Kieninger 2171-41-01 Clock Details page. Click here to view the Kieninger 2171-41-01 Options and Prices page. Kieninger 2171-41-02 - Please request a delivery forecast. Click here to view the Kieninger 2171-41-02 Clock Details page. Click here to view the Kieninger 2171-41-02 Options and Prices page. Modern cabinet in dark Walnut finish, door with bevelled glass. Wooden stick pendulum. All visible accessories are in high gloss chrome finish. Fitted with the PS 058 movement. Kieninger 2173-22-01 - Please request a delivery forecast. Click here to view the Kieninger 2173-22-01 Clock Details page. Click here to view the Kieninger 2173-22-01 Options and Prices page. Kieninger 2173-22-02 - Please request a delivery forecast. Click here to view the Kieninger 2173-22-02 Clock Details page. Click here to view the Kieninger 2173-22-02 Options and Prices page. New Model - Modern style hour striking wall clock in Walnut with chrome fittings. Kieninger 2174-22-01 - Please request a delivery forecast. Click here to view the Kieninger 2174-22-01 Clock Details page. Click here to view the Kieninger 2174-22-01 Options and Prices page. Kienington 2174-22-02 Regulator Wall Clock is a timeless and intricately designed and created wall clock in dark walnut finish and hand polished high gloss burl decorations. Genuine enamel dial with Arabic numerals, second indication and hand-milled Breguet-style hands. The clock features a polished grid pendulum and all visible accessories are chrome plated. This Kieninger RWS13 with 4/4 cable/key wound movement with pendulum, plays the Westminster chimes on 8-rod gong, automatic beat adjustment. Kieninger 2174-22-02 - 0 Delivery about two weeks directly from Kieninger. Click here to view the Kieninger 2174-22-02 Clock Details page. Click here to view the Kieninger 2174-22-02 Options and Prices page. All visible parts are in brass. Kieninger 2174-37-01 - Please request a delivery forecast. Click here to view the Kieninger 2174-37-01 Clock Details page. Click here to view the Kieninger 2174-37-01 Options and Prices page. NEW MODEL - Modern style Westminster chime wall clock in Pear with brass fittings. Kieninger 2174-37-02 - Please request a delivery forecast. Click here to view the Kieninger 2174-37-02 Clock Details page. Click here to view the Kieninger 2174-37-02 Options and Prices page. Cabinet in a Walnut finish and with glass to both sides. Kieninger 2175-23-01 - Please request a delivery forecast. Click here to view the Kieninger 2175-23-01 Clock Details page. Click here to view the Kieninger 2175-23-01 Options and Prices page. Fitted with the RWS 24 movement. Kieninger 2175-23-02 - Please request a delivery forecast. Click here to view the Kieninger 2175-23-02 Clock Details page. Click here to view the Kieninger 2175-23-02 Options and Prices page. Fine wall regulator fitted with a PS movement which strikes the hours and strkes once on the half hour. All visible accessories are in chrome plated brass. Kieninger 2175-96-01 - 0 Delivery about two weeks directly from Kieninger. Click here to view the Kieninger 2175-96-01 Clock Details page. Click here to view the Kieninger 2175-96-01 Options and Prices page. Kieninger 2175-96-02 - Please request a delivery forecast. Click here to view the Kieninger 2175-96-02 Clock Details page. Click here to view the Kieninger 2175-96-02 Options and Prices page. Kieninger 2176-22-01 - Please request a delivery forecast. Click here to view the Kieninger 2176-22-01 Clock Details page. Click here to view the Kieninger 2176-22-01 Options and Prices page. - Calibre SMV 03 triple chime movement featuring Westminster, Whittington and St. Michael melodies. - Automatic night time shut off. - White dial with Roman numerals. - Polished brass accessories. Kieninger 2176-41-01 - Please request a delivery forecast. Click here to view the Kieninger 2176-41-01 Clock Details page. Click here to view the Kieninger 2176-41-01 Options and Prices page. Classic cable regulator, cabinet in antique Walnut with burl wood inlays, bevelled crystal glasses, genuine 180mm enamel dial with second indication, polished grid pendulum. A temperature compensating pendulum is available on enquiry. Fitted with the PS 063 movement. Kieninger 2512-23-01 - Please request a delivery forecast. Click here to view the Kieninger 2512-23-01 Clock Details page. Click here to view the Kieninger 2512-23-01 Options and Prices page. Kieninger 2512-23-02 - Please request a delivery forecast. Click here to view the Kieninger 2512-23-02 Clock Details page. Click here to view the Kieninger 2512-23-02 Options and Prices page. Click here to view the Kieninger 2512-31-01 Clock Details page. Click here to view the Kieninger 2512-31-01 Options and Prices page. Click here to view the Kieninger 2512-31-02 Clock Details page. Click here to view the Kieninger 2512-31-02 Options and Prices page. Fitted with the ZSR 01 movement. Click here to view the Kieninger 2512-31-03 Clock Details page. Click here to view the Kieninger 2512-31-03 Options and Prices page. Wall Regulator in Antique Cherry. Kieninger 2512-42-01 - Please request a delivery forecast. Click here to view the Kieninger 2512-42-01 Clock Details page. Click here to view the Kieninger 2512-42-01 Options and Prices page. Kieninger 2512-42-02 - Please request a delivery forecast. Click here to view the Kieninger 2512-42-02 Clock Details page. Click here to view the Kieninger 2512-42-02 Options and Prices page. Kieninger 2512-96-02 - Please request a delivery forecast. Click here to view the Kieninger 2512-96-02 Clock Details page. Click here to view the Kieninger 2512-96-02 Options and Prices page. Kieninger 2512-96-03 - Please request a delivery forecast. Click here to view the Kieninger 2512-96-03 Clock Details page. Click here to view the Kieninger 2512-96-03 Options and Prices page. Kieninger 2512-96-04 Classical Cable Regulator Wall Clock in Black Piano Finish with Chrome accessories and beveled crystal glass. Genuine enamel dial 18 cm in diameter with second indication and chromed accessories. The arch and fluted column design is a classic statement. Kieninger RWS013 movement with 1/4 cable/key wind with pendulum. Plays the Westminster chime on 8-rod gong. Kieninger 2512-96-04 - Please request a delivery forecast. 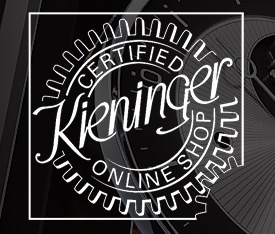 Click here to view the Kieninger 2512-96-04 Clock Details page. Click here to view the Kieninger 2512-96-04 Options and Prices page. Modern design in harmony with a classic cable movement. Cabinet in black finish with Walnut and Walnut burl back panel, bevelled crystal glass, genuine enamel 180mm dial with seconds indication and a polished grid pendulum. Kieninger 2518-92-02 - 0 Delivery about two weeks directly from Kieninger. Click here to view the Kieninger 2518-92-02 Clock Details page. Click here to view the Kieninger 2518-92-02 Options and Prices page. Fitted with the PS 057 movement. Kieninger 2520-96-02 - 0 Delivery about two weeks directly from Kieninger. Click here to view the Kieninger 2520-96-02 Clock Details page. Click here to view the Kieninger 2520-96-02 Options and Prices page. High end Vienna style cable regulator: Fine case in Mahogany with crotch Mahogany and delicate Maple inlays, integrated drawer for crank key, bevelled crystal glass, genuine enamel dial 20 cm with second indication, temperature compensation pendulum. Fitted with the RWS 21 movement. Kieninger 2542-31-01 - Please request a delivery forecast. Click here to view the Kieninger 2542-31-01 Clock Details page. Click here to view the Kieninger 2542-31-01 Options and Prices page. High end Vienna style cable regulator: Fine case in Cherry with crotch Cherry and delicate Maple inlays, integrated drawer for crank key, bevelled crystal glass, genuine enamel dial 20 cm with second indication, temperature compensation pendulum. Kieninger 2542-41-01 - Please request a delivery forecast. Click here to view the Kieninger 2542-41-01 Clock Details page. Click here to view the Kieninger 2542-41-01 Options and Prices page. Unique case in high-gloss black with walnut burl back panel and front door featuring curved, bevelled glass, silver plated calendar dial, milled Breguet-style hands and wall adjustment screws. Kieninger 2542-82-01 - Please request a delivery forecast. Click here to view the Kieninger 2542-82-01 Clock Details page. Click here to view the Kieninger 2542-82-01 Options and Prices page. Noble wall clock in dark Walnut and Chocolate Beech finish with a unique silver plated Multi-function dial. A chrome plated temperature compensation grid pendulum completes the design of this clock. Special numbered edition. Fitted with the PS 060-MK movement. Kieninger 2547-22-01 - Please request a delivery forecast. Click here to view the Kieninger 2547-22-01 Clock Details page. Click here to view the Kieninger 2547-22-01 Options and Prices page. Noble wall clock in black satin piano finish with a unique etched and silver plated dial face - visible is a superbly crafted, open dead beat escapement (Graham) with Kieniramic® anchor pallets. A chrome plated temperature compensation grid pendulum completes the design of this clock. Special numbered edition. Fitted with the PS 064-OA movement. Kieninger 2547-96-02 - 0 Delivery about two weeks directly from Kieninger. Click here to view the Kieninger 2547-96-02 Clock Details page. Click here to view the Kieninger 2547-96-02 Options and Prices page. Innovative housing with generous glazing in fine black lacquer. Walnut root veneer back panel. Pendulum with carbon fibre. Dial in real enamel. Fitted with a chrome PS058 movement and chrome accessories. Kieninger 2548-96-01 - Please request a delivery forecast. Click here to view the Kieninger 2548-96-01 Clock Details page. Click here to view the Kieninger 2548-96-01 Options and Prices page. Innovative fully glazed cabinet in fine black lacquer. The rear panel is veneered with the finest Walnut burr. Special feature of this clock is the finely crafted dial with a visible Graham dead beat escapement and with Kieniramic ® pallets. The Pendulum has a carbon fiber shaft and a chrome bob. A pendulums function is to control the time-keeping of a clock and any changes in its length will adversely effect this task - Carbon fibres length is virtually immune to temperature changes and this stability will assist in providing excellent time-keeping. Kieninger 2548-96-02 - 0 Delivery about two weeks directly from Kieninger. Click here to view the Kieninger 2548-96-02 Clock Details page. Click here to view the Kieninger 2548-96-02 Options and Prices page. Fitted with the PS 060 movement. Click here to view the Kieninger 2549-57-01 Clock Details page. Click here to view the Kieninger 2549-57-01 Options and Prices page. Fitted with the ZSR 02 movement. Click here to view the Kieninger 2549-57-02 Clock Details page. Click here to view the Kieninger 2549-57-02 Options and Prices page. 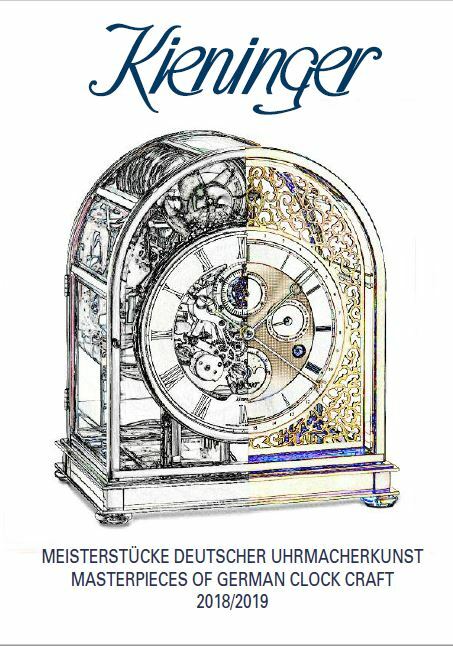 The special second pendulum clock: A fascinating example of the Kieninger clock making art for clock lovers and enthusiasts. Case in high-gloss black and back panel in Walnut with Walnut burl and delicate inlays, front door featuring curved, bevelled glass. A contemporary styled silver plated dial with a polished brass rim and with second indication, polished dial ring and hand-milled Breguet-style hands, special second pendulum with carbon fibre rod and brass bob with high precision adjustment, polished pulleys with 5 spokes and wall adjustment screws made from solid brass. Numbered edition. Fitted with the RS 009 movement. Kieninger 2565-92-01 - Please request a delivery forecast. Click here to view the Kieninger 2565-92-01 Clock Details page. Click here to view the Kieninger 2565-92-01 Options and Prices page. Contemporary styled silver plated dial with large second indication, polished dial ring and hand-milled Breguet-style hands, special second pendulum with carbon fibre rod and high precision adjustment, polished wall adjustment screws made from solid brass. All visible accessory components are chrome plated. Numbered edition. This clock is also available in high-gloss black and with the back panel in Walnut with Walnut burl and delicate inlays and with a Brass movement and accessories - listed on the Options and Prices page. Fitted with the RS 012 movement. Kieninger 2565-92-02 - Please request a delivery forecast. Click here to view the Kieninger 2565-92-02 Clock Details page. Click here to view the Kieninger 2565-92-02 Options and Prices page. Modern clock case in satin black piano finish with back panel in striking light ebony veneer and polished stainless steel inlays around case and in back panel. Click here to view the Kieninger 2566-57-01 Clock Details page. Click here to view the Kieninger 2566-57-01 Options and Prices page. Classic Walnut cabinet fitted with a spring drive regulator movement, an embossed 150mm Roman dial, a brass bezel, Breguet hands and brass grid pendulum with an 80 mm brass bob. Fitted with the APL 08 movement. Kieninger 2631-22-01 - Please request a delivery forecast. Click here to view the Kieninger 2631-22-01 Clock Details page. Click here to view the Kieninger 2631-22-01 Options and Prices page. Classic Cherry cabinet fitted with a spring drive regulator movement, an embossed 150mm Roman dial, a brass bezel, Breguet hands and brass grid pendulum with an 80 mm brass bob. Fitted with the APL 07 movement. Kieninger 2631-46-01 - Please request a delivery forecast. Click here to view the Kieninger 2631-46-01 Clock Details page. Click here to view the Kieninger 2631-46-01 Options and Prices page. New Version - Waiting for details. Click here to view the Kieninger 2633-22-01 Clock Details page. Click here to view the Kieninger 2633-22-01 Options and Prices page. Kieninger 2633-41-01 - Please request a delivery forecast. Click here to view the Kieninger 2633-41-01 Clock Details page. Click here to view the Kieninger 2633-41-01 Options and Prices page. Fitted with the J 1236 movement. Kieninger 2702-23-01 - Please request a delivery forecast. Click here to view the Kieninger 2702-23-01 Clock Details page. Click here to view the Kieninger 2702-23-01 Options and Prices page. Key wind regulator with Cherry cabinet bevelled crystal glass, elegant dial with seconds indication and polished brass panel, polished brass pendulum. Kieninger 2702-41-01 - Please request a delivery forecast. Click here to view the Kieninger 2702-41-01 Clock Details page. Click here to view the Kieninger 2702-41-01 Options and Prices page. Fine key wind regulator with dark walnut multi layer finish case, bevelled crystal glass, elegant dial with second indication and polished brass panel, polished grid pendulum. Kieninger 2727-23-01 - Please request a delivery forecast. Click here to view the Kieninger 2727-23-01 Clock Details page. Click here to view the Kieninger 2727-23-01 Options and Prices page. Stylish ultra-modern wall clock with an oiled black slate back panel and curved crystal glass front door. The TS 003 movement and all metal parts are chrome plated. The clock strikes the hours on a top-mounted chrome plated bell and there is a hidden compartment for the winding key. A carbon stick pendulum and chrome plated accessories complete the design. Fitted with the TS 003 movement. Kieninger 2730-96-01 - Please request a delivery forecast. Click here to view the Kieninger 2730-96-01 Clock Details page. Click here to view the Kieninger 2730-96-01 Options and Prices page. Art meets clock design - Ultra slim design wall clock in dark ebony veneer with chrome plated metal frame and key drawer and dekorative fins in dark ebony. Caliber ZPS01 cable stick movement with passing strike, open escapement and special real time pendulum adjustment system with the control knob located on the dial; this feature is unique to the ZPS01 movement as the adjustment of time-keeping is achieved without stopping the pendulum, hence increasing accuracy. Unique spherical shape pedulum is enhanced by enlarging mirror. Fitted with the ZSP 01 movement. Kieninger 2731-57-01 - 0 Delivery about two weeks directly from Kieninger. Click here to view the Kieninger 2731-57-01 Clock Details page. Click here to view the Kieninger 2731-57-01 Options and Prices page. New Model - Sperica, art meets clock design - ultra slim design wall clock in black satin piano finish with multi-coloured panels and a key drawer. Decorative fins out of handcrafted ceramic elements. Caliber ZPS01 cable stick movement with passing strike and a visible escapement and a Float glass dial. Special real time pendulum adjustment system with the control knob located on the dial; this feature is unique to the ZPS01 movement as the adjustment of time-keeping is achieved without stopping the pendulum, hence increasing accuracy. The unique spherical shape pendulum bob is enhanced by an enlarging mirror. Kieninger 2731-90-01 - Please request a delivery forecast. Click here to view the Kieninger 2731-90-01 Clock Details page. Click here to view the Kieninger 2731-90-01 Options and Prices page. New Model - Slim Wall Clock in an olive wood finish. Click here to view the Kieninger 2732-59-01 Clock Details page. Click here to view the Kieninger 2732-59-01 Options and Prices page. New Model - Slim Wall Clock in a red laquer finish. Click here to view the Kieninger 2732-77-01 Clock Details page. Click here to view the Kieninger 2732-77-01 Options and Prices page. New Model - Slim Wall Clock in an gloss black laquer finish. Fitted with the TS003 movement. Click here to view the Kieninger 2732-96-01 Clock Details page. Click here to view the Kieninger 2732-96-01 Options and Prices page. Classic "Wiener Dachl"-type miniature regulator in antique walnut with 4 bevelled crystal glasses, genuine 115 mm enamel dial with seconds indication and polished brass rim, blue Breguet-style steel hands, a wooden pendulum with polished 80 mm disk and a 800 gram polished brass weight. Fitted with the NS 004 movement. Click here to view the Kieninger 2800-23-01 Clock Details page. Click here to view the Kieninger 2800-23-01 Options and Prices page. Classic "Wiener Dachl"-type miniature regulator in cherry with 4 bevelled crystal glasses, genuine 115 mm enamel dial with seconds indication and polished brass rim, blue Breguet-style steel hands, a wooden pendulum with polished 80 mm disk and a 800 gram polished brass weight. Click here to view the Kieninger 2800-41-01 Clock Details page. Click here to view the Kieninger 2800-41-01 Options and Prices page. Classic "Wiener Dachl"-type miniature regulator in hand polished black finish with 4 bevelled crystal glasses, genuine 115 mm enamel dial with seconds indication and polished brass rim, blue Breguet-style steel hands, a wooden pendulum with polished 80 mm disk and a 800 gram polished brass weight. Click here to view the Kieninger 2800-96-01 Clock Details page. Click here to view the Kieninger 2800-96-01 Options and Prices page. Classic "Wiener Dachl"-type miniature regulator in fine black lacquer finish, 4 bevelled crystal glasses, genuine 115 mm enamel dial with second indication and chrome rim, blue Breguet-style steel hands, a wooden pendulum with chrome plated 80 mm disk and a chrome plated brass weight. Kieninger 2800-96-02 - 0 Delivery about two weeks directly from Kieninger. Click here to view the Kieninger 2800-96-02 Clock Details page. Click here to view the Kieninger 2800-96-02 Options and Prices page. Minimalistic miniature regulator. Cabinet in dark Walnut with a Walnut burl finish and mother of pearl effect inlays and fitted with bevelled crystal glass. Genuine 11,5 cm enamel dial with second indication and polished brass rim, blue Breguet-style steel hands, a wooden pendulum with polished 8 cm disk and polished brass weight. Kieninger 2806-22-01 - 0 Delivery about two weeks directly from Kieninger. Click here to view the Kieninger 2806-22-01 Clock Details page. Click here to view the Kieninger 2806-22-01 Options and Prices page. Classic elegant mid size cable regulator with extremely flat case design case in Walnut with a fine lacquered finish and fitted with bevelled crystal glass. Fitted with the NS 005 movement. Kieninger 2851-23-01 - Please request a delivery forecast. Click here to view the Kieninger 2851-23-01 Clock Details page. Click here to view the Kieninger 2851-23-01 Options and Prices page. Classic elegant mid size cable regulator with extremely flat case design case in Walnut with a fine lacquered finish and fitted with bevelled crystal glass. Chrome plated accessories. Fitted with the NS 006-MK movement. Click here to view the Kieninger 2851-23-02 Clock Details page. Click here to view the Kieninger 2851-23-02 Options and Prices page. Fitted with the NSM03-MK T movement. Click here to view the Kieninger 2851-23-04 Clock Details page. Click here to view the Kieninger 2851-23-04 Options and Prices page. Classic elegant mid size cable regulator with extremely flat case design case in Cherry with a fine lacquered finish and fitted with bevelled crystal glass. Click here to view the Kieninger 2851-41-01 Clock Details page. Click here to view the Kieninger 2851-41-01 Options and Prices page. Classic elegant mid size cable regulator with extremely flat case design case in Cherry with a fine lacquered finish and fitted with bevelled crystal glass. Chrome plated accessories. Click here to view the Kieninger 2851-41-02 Clock Details page. Click here to view the Kieninger 2851-41-02 Options and Prices page. Click here to view the Kieninger 2851-96-01 Clock Details page. Classic elegant mid size cable regulator with an extremely flat cabinet design. Cabinet in fine black lacquer finish and fitted with bevelled crystal glass. Silver plated multifunctional dial with etched rhombic decoration, diamond turned chapter rings, second indication, day of the month, day of the week, month calendar, moon phase feature and easy adjustment of all functions; blued Breguet style hands and accessories in chrome plated brass. Click here to view the Kieninger 2851-96-03 Clock Details page. Click here to view the Kieninger 2851-96-03 Options and Prices page. Click here to view the Kieninger 2851-96-04 Clock Details page. Click here to view the Kieninger 2851-96-04 Options and Prices page. Cabinet in dark Walnut with Walnut burl finish and with mother of pearl effect inlays. The cabinet is glazed with bevelled crystal glass. The clock has a genuine 115 mm enamel dial with second indication and polished brass rim, blue Breguet-style steel hands. The pendulum has a wooden shaft with a polished 80mm brass bob and drive is powered by a polished brass weight. Click here to view the Kieninger 2852-22-01 Clock Details page. Click here to view the Kieninger 2852-22-01 Options and Prices page. Extremely slim cable regulator with a cabinet in dark Walnut finish combined with Walnut burl. To minimise visual obstructions the glass side panels are UV bonded. There is a drawer for the winding key. The clock has a multifunctional dial with diamond turned deco rings, second indication, day of the month, day of the week, month calendar and moon phase feature. Click here to view the Kieninger 2852-22-02 Clock Details page. Click here to view the Kieninger 2852-22-02 Options and Prices page. Click here to view the Kieninger 2852-96-02 Clock Details page. Click here to view the Kieninger 2852-96-02 Options and Prices page.